I also would like to suggest a relatively easy to implement (I know this I’m a computer scientist) but huge improvement. The possibility to set multiple fitting links sub-methods in manufacturing methods, and maybe ability to rename them. Why is this important? For example at my factory we have different assembly fittings, different door hinges and locks and handles, different kinds of drawers. I’d setup for example 2 assembly fittings, 3 hinge fittins, 5 locks/handles, 3 drawer types. There would be 2x3x5x3 = 90 combinations. I dont want to bloat my library with 90 manufacturing methods, but if I want to use assembly fittings of a manufacturing method, and hinge fittings from another manufacturing method, I’d have to copy one and manually ad the fittings of the other. It would be easily done if there were for example 4 fitting links submethods in the the manufacturing method, using one for assembly fittings, another for hinges, and so on, you just need to select one of those. I hope I explained myself. Thanks for the great product btw. Great Suggestion! I actually wanted something like that. It would be so much easier if there was a separate fitting link submethod for drawers because for now – yes: the library is becoming very big just because of small variations. This is a great idea and we will certainly send this to the developers to add to their list of future improvements. Thanks for your post and interesting suggestions. 1- A mirror command is a great idea that has often been requested and the development team at Boole have on their books for sometime now. However, due to the internal structure of Polyboard this is not as simple as adding a similar function to a CAD program. As we have limited resources for the time being this function is not planned in the near future. 2- A layer function would be a great addition and I’ll certainly forward this request to the developer team. 3- Smart drawers would also be great, however, this is a vast and complicated question as the developers have to create a tool that can cope with every situation and configuration for all brands of hardware. What we’d like to see them implement would be a script programming language that could allow us to create what you are asking from the basic Polyboard commands. 4- I agreed that the possibility to add annotations would be great. For the time being you have to export to CAD to do this. 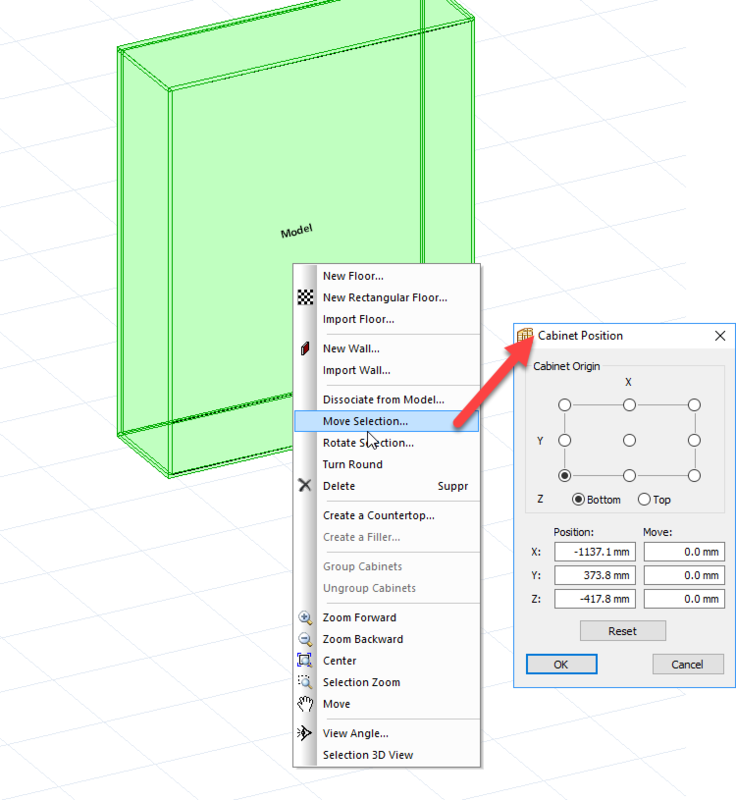 As this is a simple process and you can use free CAD systems like Draftsight or SketchUp I don’t think this is a big issue as it will be a lot of work to implement all the functions of a CAD program inside Polyboard. However it would certainly be a good idea to add a few extra functions so as not to have to learn a new CAD program. 5- Moving cabinets along certain distances is already possible in Polyboard. If you select a cabinet and click right, in the menu choose “Move Selection” the “Cabinet Position” dialogue box will allow you to specify a right / left deplacements (+x for right, -x for left) and the same up / down using the Y axis. Using the”Rotate Selection” command it’s possible to turn the cabinet too. Thanks again for all these very helpful suggestions, and I’ll get the development team to read this post. 1. Mirror function for cabinet: happened few times for me when I spent some time on a complicated cabinet and needed a mirror version of it so I needed to construct one from scratch again. 2. Layers: ability to put elements/cabinets on layers and hiding or locking them. 3. Smart drawers: If a user could program polyboard to tell it which length of drawer rail and prefab drawer sides to use depending on the given volume that would result in less thinking and less errors in my mind. Use case scenario: user clicks on the volume and chooses drawer type, polyboard prompts the user with a message showing the max drawer length (and height if prefab drawer sides are used) that can be put in that volume. If that volume is changed during the design process polyboard can prompt the user asking if he/she wants to change them to the next biggest available drawer (drawer and fitting links). All of our hardware for drawers is of GRASS brand and the drawer lenghts are dependant on the rail length and are coming in increments. 4. Annotations: ability to add text pointing to some element. Those are just some ideas although not sure how easy it would be to implement them. I think the features that I mentioned could help a lot of companies that are already using the program be even more productive and error free and have potential to make polyboard even more attractive to potential new customers.